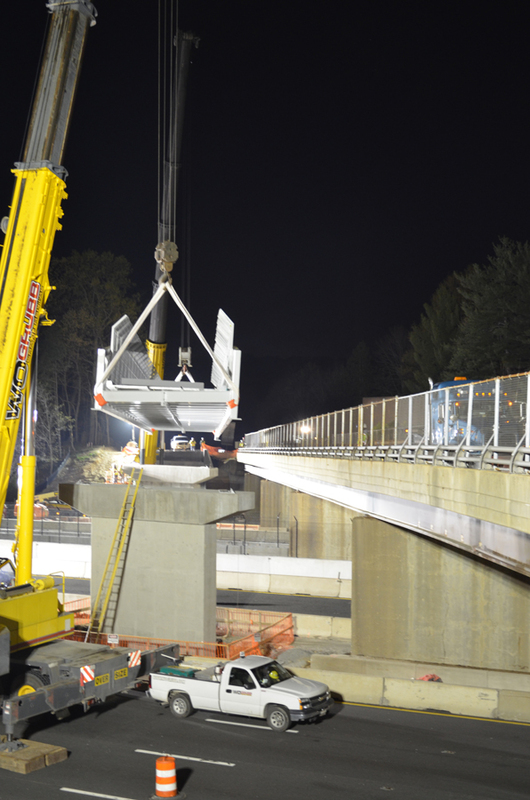 Bridge span being lowered into place. The first span of the pedestrian and bicycle bridge over the Dulles Toll Road at Wolf Trap Farm Park was installed last night. This bridge will connect the trail on the south side of the Toll Road with a new trail on the north side that will lead to the park. The existing bridge on Trap Road over the Toll Road is very narrow with no room for pedestrians. This project is part of the Beulah Road Walkway Project that was initiated by the NoVi Trails group headed by Jenifer Madden. It shows that hard work, persistence, and patience pays off. Funding was obtained from several sources with the help of Congressman Moran and the support of Supervisors Hudgins and Foust. The final span of the bridge will be installed tonight. Congratulations to Jenifer for her work on making this facility a reality. Nice! I've cycled to Wolf Trap via the W&OD and the Trap Road overpass in the past, and while the overpass itself wasn't bad, the south side of Trap Road was awful.